Important Announcement By the Lord Lieutenant. 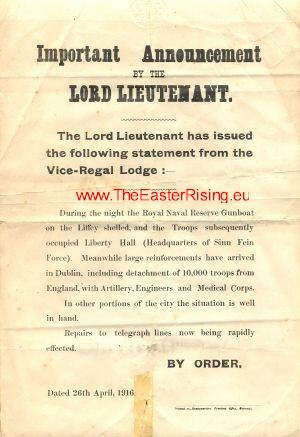 The Lord Lieutenant has issued The following statement from the Vice-Regal Lodge:- During the night the Royal Naval Reserve Gunboat On the Liffey shelled, and the Troops subsequently Occupied Liberty Hall (Headquarters of the Sinn Fein Force). 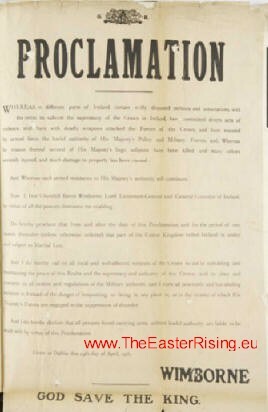 Meanwhile large reinforcements have arrived In Dublin, including detachment of 10,000 troops from England, with Artillery, Engineers and Medical Corps. In Other portions of the city the situation is well In hand. Repairs to telegraph lines now being rapidly Effected. 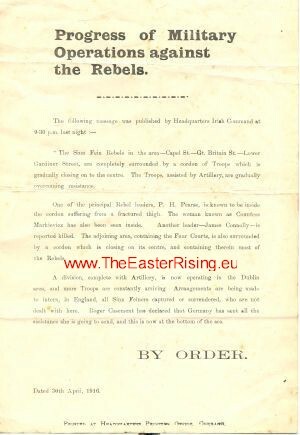 “The Sinn Fein Rebels in the area – Capel St. – Gt. Britain St. – Lower Gardiner Street, are completely surrounded by a cordon of Troops which is gradually closing on the centre. The troops assisted by Artillery, are gradually overcoming resistance. One of the principal Rebel leaders, P. H. Pearse is known to be inside The cordon suffering from a fractured thigh. The woman known as Countess Markievich has also been seen inside. 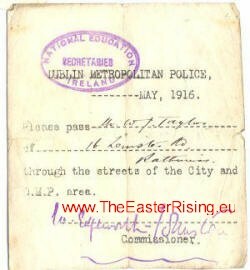 Another leader – James Connolly – is reported killed. The adjoining area, containing the Four Courts, is also surrounded by a cordon which is closing on its centre, and containing therein most of the Rebels. 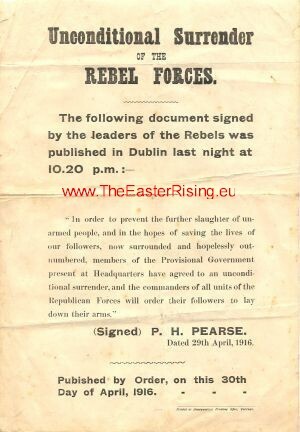 A Division, complete with Artillery, is now operating in Dublin Area, and more Troops are constantly arriving. 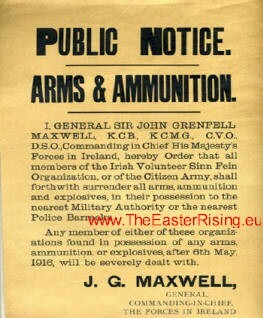 Arrangements are being made To intern in England, all Sinn Feiners captured or surrendered, who are not Dealt with here. Roger Casement has declared that Germany has sent all the Assistance she is going to send, and this is now at the bottom of the sea. Printed at Headquarters Printing Office, Curragh. Unconditional Surrender Of the Rebel Forces. 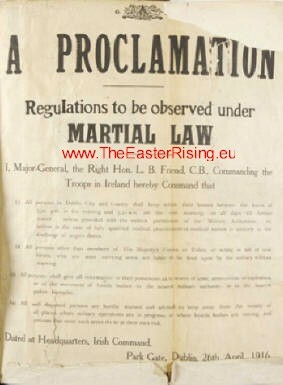 Dated 29th April, 1916 ………………………………………………………… Published by order, on this the 30th Day of April, 1916. Maxwell, J.G. General Commanding in Chief the Forces in Ireland. "Public Notice. Arms & Ammunition." 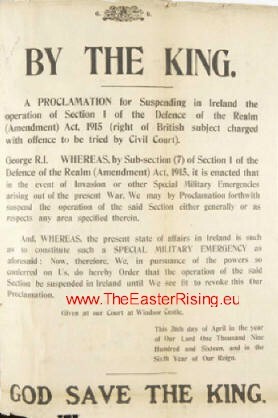 Ordering 'all members of the Irish Volunteer Sinn Fein Organisation, or the Citizen Army," to surrender Arms ammunition and explosives in their possession to the nearest military or police authority; and warning that anyone found in possession of arms or explosives after 6 May 1916 will be severely dealt with. 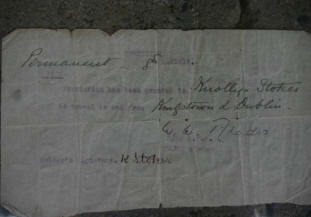 Dated 2 May 1916.